Installing the Phanteks PH-TC14PE CPU cooler for the first time was straight forward but a little fiddlely as the instructions were vague is spots. Fortunately, the mounting hardware on the back of the Rampage V Extreme (RVE) motherboard was a direct match with the CPU cooler hardware so the mounting bracket on the back of the motherboard did not need to be changed. The four socket screws fit perfectly and were screwed in by hand. A strip plate was installed between two socket screws with one above the processor and one below the processor. Screw nuts hold the strip plates in place. Installing the hardware was easy, it took a few tries to get the hardware mounted in the correct direction and using the correct mounting holes spacing between the strip plates so that the heatsink would attach correctly. The two strip plates should be mounted so that the center threaded studs are as close together as possible. The strip plates and screw nuts can be seen in Figure 1. A mounting plate must be attached to the base of the heatsink with a mounting plate screw. Balancing the mounting plate and screw in place, and getting the screw tightened requires a long Philips head screw driver and a lot of force. The center of the mounting screw is in the center between the two cooling towers making it awkward to get it installed correctly. During this assembly process, I forgot to take photographs so see the installation video below for more details. With the mounting hardware installed, it was time to apply the thermal compound. 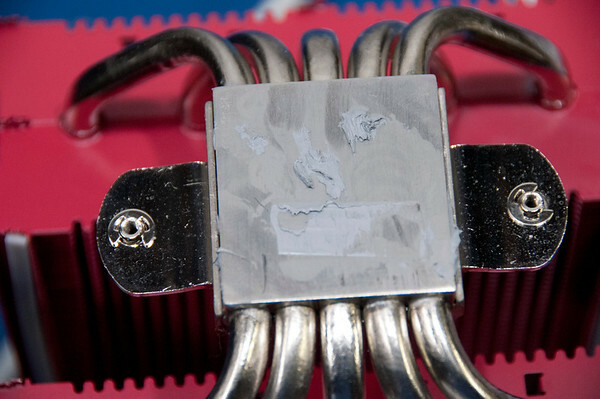 Figure 1 also shows the thermal compound applied to the processor. It was easy to clean the processor with alcohol wipes and lens paper. The base of the CPU cooler had adhesive stuck to it so it required extra cleaning to remove it. The base of the CPU cool had some ridges in it. I expected it to be smoother. I used a plastic spatula to apply the thermal compound to the processor and base of the CPU cooler. I don’t recommend using a plastic spatula. The one I used wasn’t ESD safe and the thermal compound stuck to the plastic better than the metal of the processor and cooler base. I used a glove finger to apply the thermal compound to the base by rubbing it in really well. The thermal compound also liked the glove more than the metal surfaces too. Figure 2 shows the base of the Phanteks PH-TC14PE CPU cooler with thermal compound coating the surface. I spread the thermal compound out instead of applying one big drop as described in the instruction sheet to ensure complete coverage of the thermal compound. In the past, I had done work with designing a power supply with high power MOSFETs. I found that a uniform application of thermal compound or Thermal Interface Material (TIM) is critical for running in the safe operating area of the MOSFET. A good application of the TIM can minimize the thermal resistance between the MOSFET or processor and the heatsink. While measuring the floating point performance of the processor, the temperature increased by 50 ºC while dissipating 200 W. This indicates that the processor and heatsink have a thermal resistance of about 0.25 ºC/W. 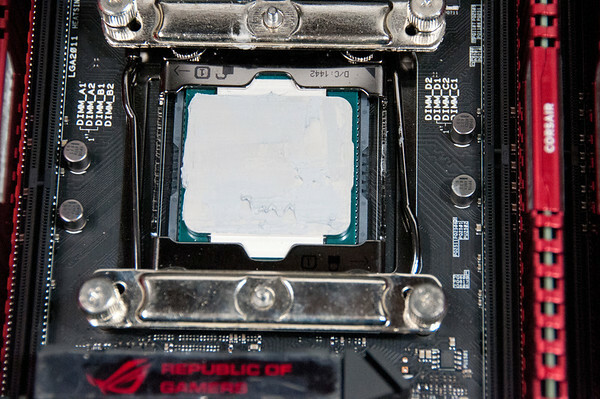 This is consistent with thermal resistance values reported in some of the CPU cooler reviews, and indicates a good application of the thermal compound and attachment of the heatsink. The heatsink is attached to the strip plates by two screws that a part of the mounting plate. The heatsink must be placed on the processor and aligned precisely before the screws will engage. Again, this was an awkward installation as a long screw driver is needed and it’s hard to see the alignment down in the case. The center fan must be removed for this installation. A Y-cable adapter connects the two fans together so that they can be connected to the CPU controller fan port on the motherboard and controlled in parallel. 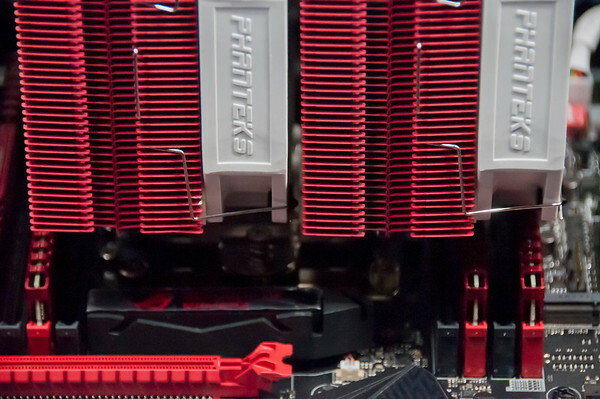 Figure 3 shows Phanteks PH-TC14PE CPU cooler installed on the CPU. 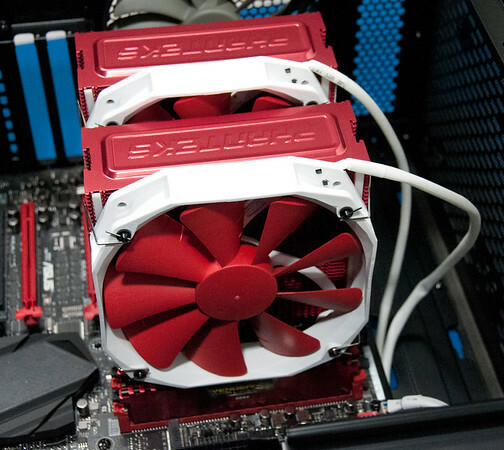 The fans have been adjusted slightly for a better fit and alignment above the DDR4 DIMMs. The heat pipes and fans clear the DDR4 DIMMs. 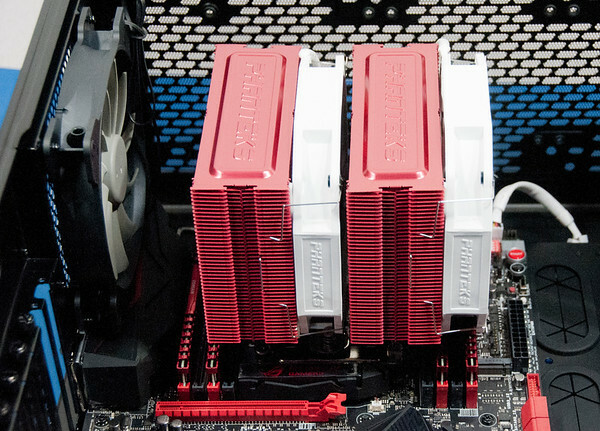 Figure 4 shows a somewhat blury close up of the Phanteks PH-TC14PE CPU cooler and Corsair Vengeance LPX DDR4 DIMMS. Figure 5 shows the fan side the Phanteks PH-TC14PE CPU cooler. Figure 6 shows the installation video of the Phanteks PH-TC14PE CPU cooler.